Kentucky Fried Chicken's plan to advertise its new "fiery" chicken wings on fire hydrants and fire extinguishers ran hot and cold among customers at a KFC in Brooklyn, N.Y.
"I don't think it's a bad idea," Hector Rodriguez, an ice cream deliveryman, told WalletPop. "Fire hydrants are everywhere. People will see them." Rodriguez's, son, Hector Jr., also a deliveryman, saw it differently: "A fire hydrant is a fire hydrant. It's not a billboard." But that's precisely why KFC is doing business where dogs do their business, according to an Associated Press story that ran in USA Today about the $15,000, month-long advertising effort. A fire hydrant is not a typical venue to get the word out. The article touted the maneuver as a larger trend in which advertisers are hoping to go where no campaign has gone before. Along with the scent of a deep fryer hard at work, change is in the air for a company like KFC that is trying to sell more cluck for its buck. The fast-food giant bolstered the coffers of two Indiana cities, Indianapolis and Brazil, with $7,500 total to put Colonel Sanders' mug on municipal hydrants and extinguishers to ignite interest in the spicy wings, according to the article. KFC is reaching out to other cities to see if they're interested. Consumers burned out by traditional advertising plus an economic meltdown have compelled companies to move off billboards and onto the streets, the story said. KFC forked over $16,000 last year to fix about 1,500 potholes in Topeka, Kan.; Chattanooga, Tenn.; Warren, Ohio; and Louisville, KFC's headquarters. The newly smooth asphalt read, in removable chalk, "Re-Freshed by KFC." Laura Ries, president of the marketing consulting firm Ries & Ries outside Atlanta, told AP that hitting consumers in unlikely places will get some attention, at least initially. Geraldy Ligonde, who drives a van to transport the disabled, told WalletPop he isn't buying it. "I don't see that as appealing at all. It's a fire hydrant. You're not going to be thinking about food." "We have enough advertising on the windows," added Chalette Powell, a KFC clerk in Brooklyn. Angela, also part of the lunch crowd at a KFC on Coney Island Avenue in Brooklyn, said the fire hydrants' effectiveness in attracting the eye relies heavily on design. "It depends on the color," said Angela, who didn't give a last name. No word yet if KFC plans to expand its strategy. Javier Benito, a KFC executive vice president, told AP that the merchant wants consumers to see it can be civic-minded, too. In this case, a pair of cash-strapped communities needing new or renovated fire equipment secured the necessary funds, and KFC earned a chance to crow about its brand in an unusual way. Indianapolis gets $5,000 to be spent on extinguishers and smoke detectors, the AP said. 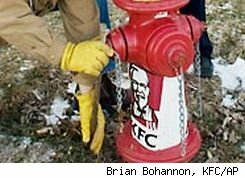 Brazil received $2,500 to allow KFC to post its logo and actual chicken buckets on at least three highly visible hydrants. Mayors of both towns said they did what was necessary for cash flow. Hector Rodriguez, Jr., wrapping up his noon repast in Brooklyn, wanted to extinguish the thought. "What's next?" he asked. "They're gonna advertise on the back of fire trucks? Truck sponsored by KFC?"